March brings both the Pasifika Festival and ASB Polyfest, and in addition to this Auckland Libraries have been celebrating Pasifika with a range of events throughout the region. This provides a great opportunity to have a closer look at some historic Pacific language items in our heritage collections. 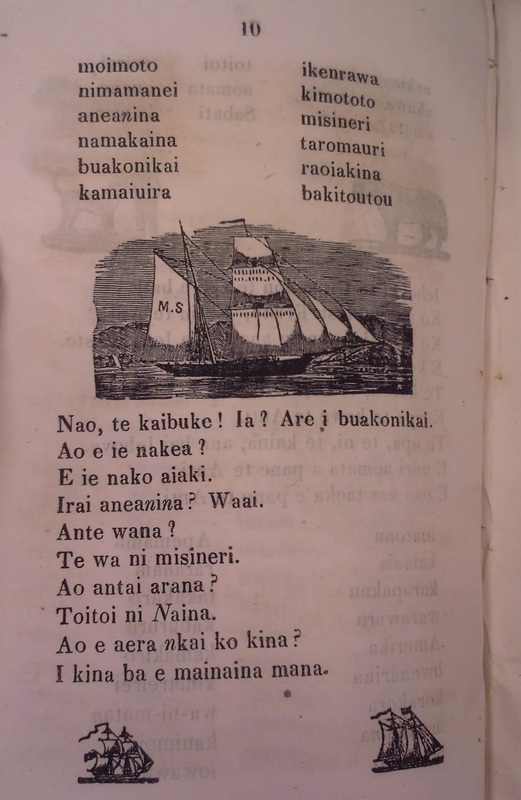 These are some of the earliest printed materials in the Kiribati language, which was formerly known as Gilbertese. These translations are by Hiram Bingham II, who was the first person to translate the Bible into Kiribati, his wife Mrs. M. Clarissa Brewster Bingham, Hawaiian missionaries and Kiribati students. The library holds a number of these publications dating from 1860 onwards, which were acquired by Sir George Grey due to his interests in indigenous languages and philology. Hiram Bingham II and Clarissa went to Kiribati on the Morning Star, which was funded by 10 cent contributions from children across the United States. You can read Bingham II’s Story of the Morning Star via the Internet Archive. In addition to using religious texts as colonial tools, the missionaries in the Pacific also produced primers of grammar and arithmetic. 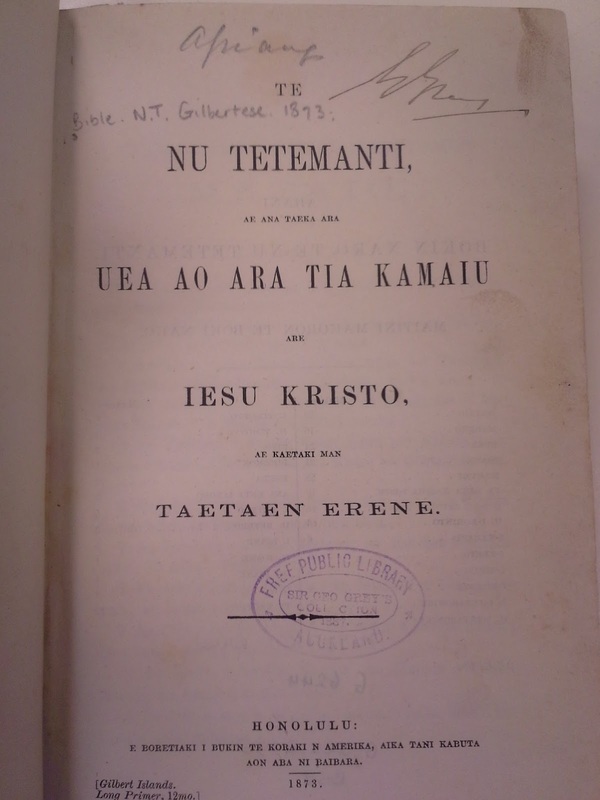 This is the earliest publication we hold in Kiribati, a Gilbert Island primer, also containing hymns compiled by Bingham II on pages 7-20. This particular hymn is illustrated with a picture of the Morning Star. Ref: Te Boki ni wareware, p.10, Hiram Bingham II, 1860, Sir George Grey Special Collections, Auckland Libraries, 499.52 TEBO. 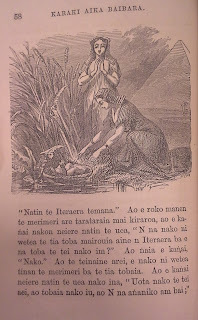 Samuel Chenery Damon, a missionary based in Honolulu, went on the 5th journey of the Morning Star from May to August 1861 which anchored in Abaiang, Kiribati, where he observed the Binghams at work. Damon was also an acquaintance of Sir George Grey and sent Grey a copy of his log of the journey, published as a pamphlet titled The Morning Star papers. In this pamphlet Damon notes that, one student in particular “actively engaged with Mr. B[ingham] in the work of translation. The assistance which he renders is vastly important. After they had collected about two thousand words of the language, Mr. B, offered this young man one dollar a hundred for additional words. In the work of translation he goes over with Mr. B. word by word of the New Testament (p.12)." Ref: Karaki iaka Baibara, p.58, Clarissa Bingham, 1866, Sir George Grey Special Collections, Auckland Libraries, 220.95 K18. 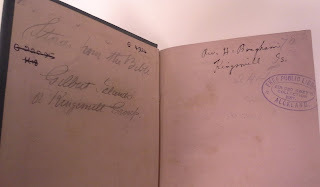 This edition was Hiram’s own copy of Clarissa’s work as you can see by the signature on the fly leaf. Ref: Karaki iaka Baibara, fly leaf, Clarissa Bingham, 1866, Sir George Grey Special Collections, Auckland Libraries, 220.95 K18. 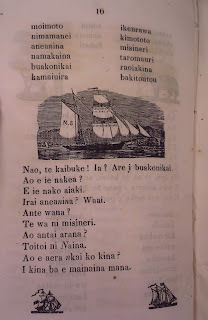 The ongoing importance of this work can be seen in our collections where the most recent Kiribati-English dictionary (from 2010) is a reprint of the one Bingham II published a century earlier in 1908. 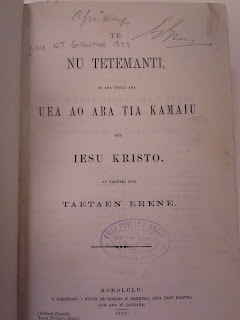 You can see below the title page from first time the New Testament was translated into Kiribati, published in 1873, although as Damon's comments above show it was worked on since at least 1861. 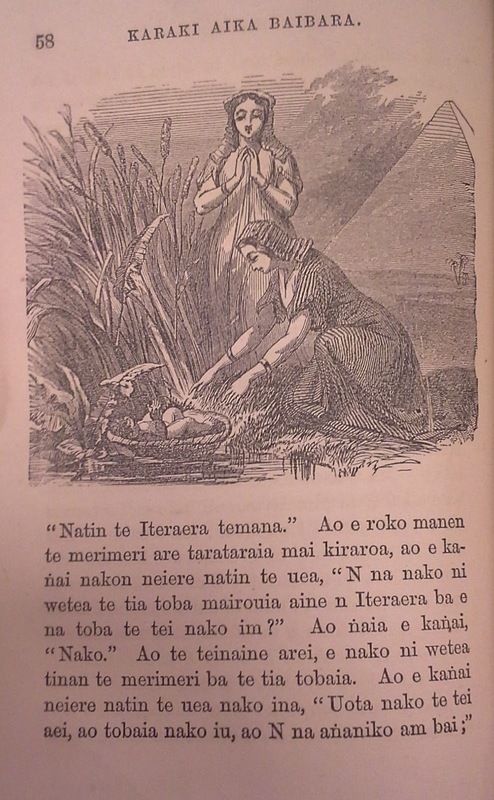 Ref: Te Nu Tetemanti, title page, American Bible Society, 1873, Sir George Grey Special Collections, Auckland Libraries, 225.5995 B58. The story of the Bingham’s and their mission to Kiribati can be seen as somewhat of a microcosm of the past 400 years of Western European colonisation. Clarissa Bingham was a descendant of William Brewster who was one of the Puritans who went to New England on the Mayflower in 1620. Bingham II himself was the son of Hiram Bingham I who was the first American missionary in Honolulu in 1820 according to Michael Dougherty’s book on Hawaiian history, To steal a kingdom. Incredibly this is only a small part of the story of the Bingham family. Hiram and Clarissa’s son Hiram Bingham III bought international attention to Machu Picchu with his book Lost city of the Incas and grandson Hiram Bingham IV was a United States diplomat who helped over 2,500 Jewish refugees flee from France as Hitler’s armies invaded.